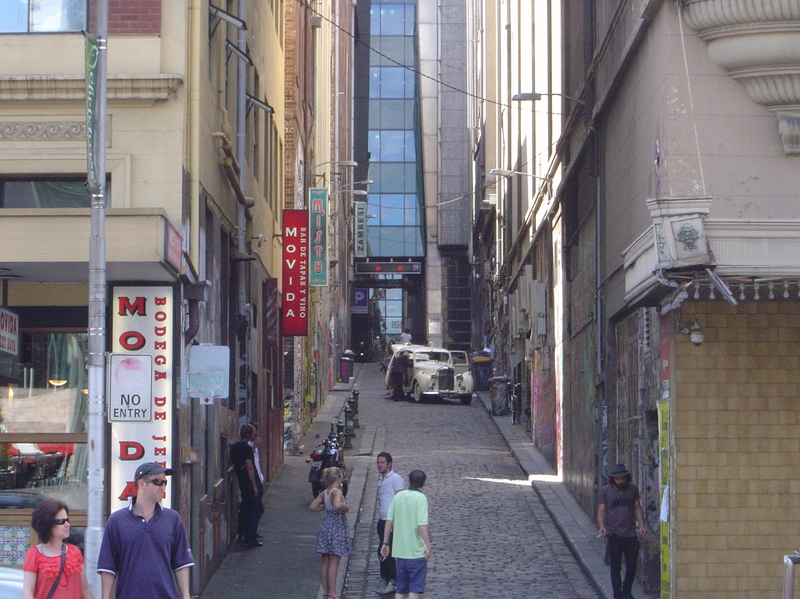 Melbourne City Council’s plans to spend $60,000 on installing two CCTV cameras in Hosier Lane and Rutledge Lane could destroy a world-class cultural asset. 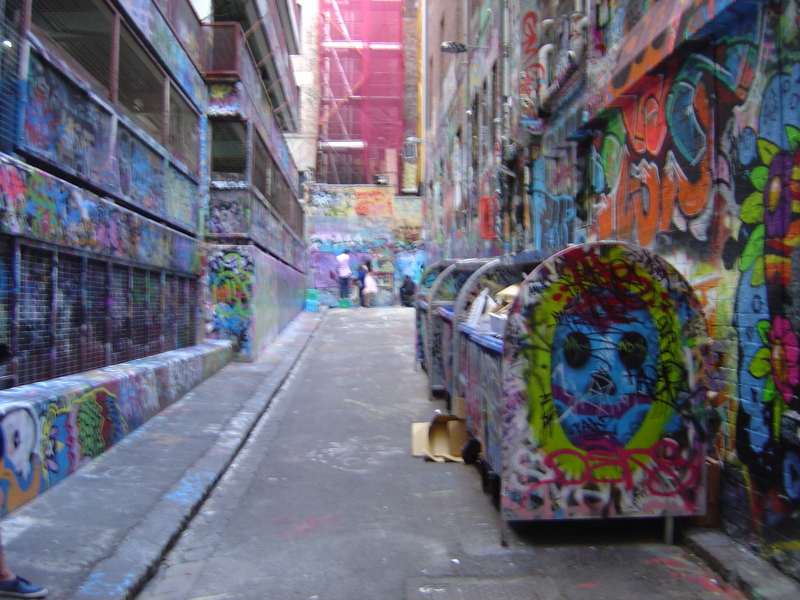 The street art in Hosier Lane is Melbourne’s 3rd most popular tourist attraction. You can read in The Age about the council meeting where Fletch (of Invurt) spoke to Melbourne City Council and got them to defer the decision. There are so many levels to this issue that need to be discussed from the philosophical, the political, the aesthetic, criminological and the practical, empirical evidence. After so many meetings, emails, phone-calls and other communications… I don’t know where to start. Looking up Hosier Lane with wedding party arriving. Hosier Lane is a popular site for wedding photos. On Friday the 7th I was listening to a paper by Prof. Saul Newman, Reader, Dept. of politics, Goldsmiths, University of London at the Victorian College of the Arts. Prof. Newman argued that there is a need for anonymity in the coming politics, considering Giorgio Agamben’s state of exception, and the desire for governments to have a monopoly on appearance. Issues including Foucault’s interpretation of Jeremy Bentham’s Panopticon were being discussed. Philosophy is not isolated from the world and current events; it is, in away scouting out new territory, way ahead of the frontline. This time philosophy proved prescient and on the weekend I plunged into this current issue of trying to stop the installation of CCTV cameras in Hosier Lane. What are the problems that the CCTV hopes to solve? The most important issue on the mind of Mayor Robert Doyle was assaults – there have been several assaults in the two lanes and reducing assaults should be a high priority. Will CCTV cameras do this? I’ve been looking at systematic reviews of the effectiveness of CCTV cameras; a systematic review is an independent assessment of all the evidence gathered from multiple studies. According Skinns to “the introduction of CCTV had no effect on the personal crime offences such as assault.” (Skinns, D (1998) ‘Crime Reduction, Diffusion and Displacement: Evaluating the Effectiveness of CCTV’ in Norris, Moran and Armstrong (eds.) (1998) Surveillance, Closed Circuit Television and Social Control, Ashgate) The only strong evidence for crime reduction due to CCTV cameras is when they are used in car parks to stop vehicle crimes. There are a range of other problems with installing CCTV cameras include the targeting of minority groups by police and the supply of data to US intelligence via TrapWire (see Darker Net). 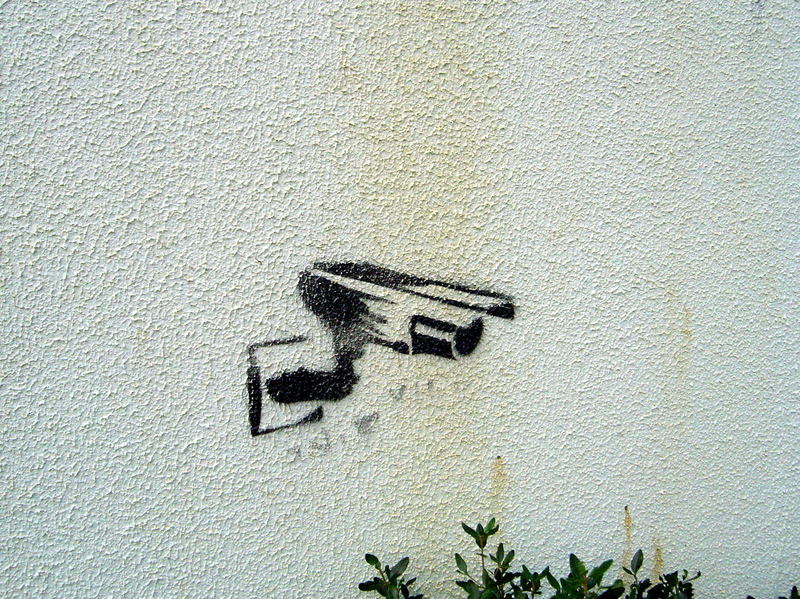 Trapwire has prompted Anonymous to call for the destruction of all CCTV cameras (see their video) adding another problem to this mix – the likely destruction of these expensive cameras. This is not the ravings of a conspiracy theory blogger; the residents of Hosier Lane are concerned about damage to their property as a resident’s window was broken when the mirrors installed in the lane were broken. What would be the likely outcome of installing CCTV in Hosier or Rutledge Lanes? Even though there are street art permits for some part of the lanes the artists that worked in there will not feel anonymous and worry that they will be tracked through the network of CCTV cameras in the city. The consequence of this will be to drive the better artists away leading to a reduction in quality of the art in the lane and ultimately the loss of this unique cultural location without any reduction of assaults. Wisely Melbourne City Council has already installed lockers for bins to prevent fires being lite in them and budgeted for increased street lighting in Hosier Lane (a parallel systematic review about street lighting found a reduction in crime by 20%). This is a complex the political, the aesthetic, criminological and social issue and there must be a better way to spend $60,000 (plus maintenance and the cost of staff to monitor the cameras) to reduce assaults in Hosier and Rutledge Lane. The story continues in CCTV or not CCTV (Act 2). 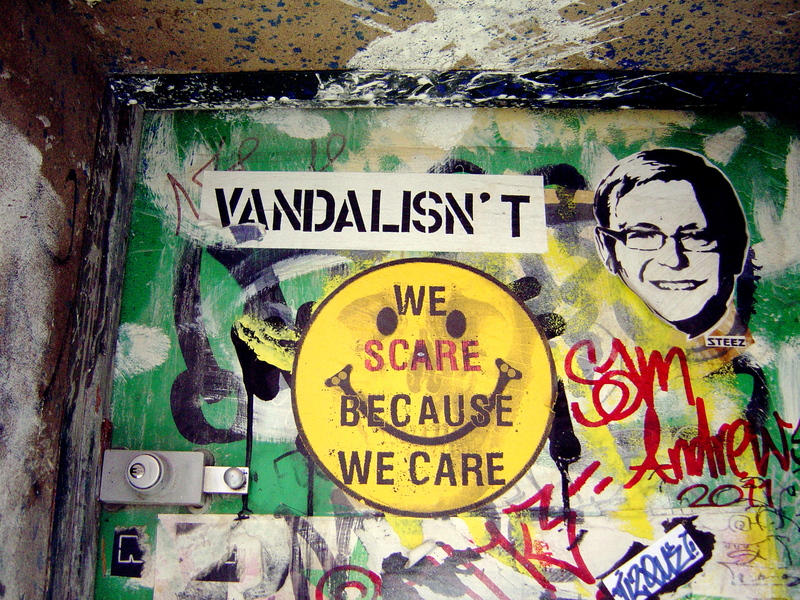 This entry was posted on Thursday, September 13th, 2012 at 9:49 AM	and tagged with Andy Mac, CCTV cameras, criminology, giorgio agamben, Hosier Lane, Lord Mayor Robert Doyle, Melbourne, Melbourne City Council, philosophy and posted in Culture Notes, Street Art. You can follow any responses to this entry through the RSS 2.0 feed. May I ask for a link for Prof. Saul Newman’s paper? Thanks. No link but I do have a copy. Nicely considered article thanks Mark. I’ll take this opportunity to raise here a few crucial points regarding the so-called ‘CCTV initiative’ as a long-time Hosier Lane resident. 1. At no stage were CCTV’s seriously considered (in their punitive guise) by the Hosier-Rutledge community. More accurately, a sketch idea involving the deployment of video installations, and subsequently the possibility of a localised ‘digital mirror’, was the pre-cursor to the eventual MCC mis-interpretation during the ongoing community/policing discourse. The CCTV debate is a furphy, and should be used to divert the discourse around finding a way forward for Rutledge Lane. 2. An important goal for this relatively new community is the seeking of respect – for the businesses, residents, Living Room clients, street activities (including street art), tourists and untold other participants of this amenity. All we ask is that the lanes be treated better, particularly by unwitting vandals. Our experience has shown that disrespectful events attract actions of greater disrespect, and eventually leading to criminal activity. It’s a simple message – treat Hosier and Rutledge Lanes with respect – for everyone’s benefit and safety. 3. We are currently wrestling with a way to define and encourage respect within this context. Robert Doyle finds himself confronted with this problem pertaining to the laneway eco-system. It appears (to me) to be an issue of information, and finding mechanisms best suited to delivering the correct information to not just the laneway users but to the wider community. We treasure the vitality of this place and look forward to ongoing informed dialogue. Go to http://hosierrutledge.wordpress.com/ and contribute.